Medical Media Images Blog: What is an Artificial Disc Replacement of the Neck? What is an Artificial Disc Replacement of the Neck? Artificial Disc Replacements (ADRs) for the Neck (Cervical Spine) are small, high tech devices which are designed to function like a normal Spinal Disc between the Vertebrae. The job of a normal Disc is to act like a "cushion" or "shock-absorber" between the hard bone surfaces of the Neck Vertebrae. Where is the Disc located in the Neck? The discs are located in the front of the Spine between the largest parts of the Neck Vertebrae called the "bodies" of the Vertebrae. Below is an Interactive Color MRI which shows you the Anatomy of the Neck (Cervical Spine). This Image is Interactive. Just move your Mouse Cursor over the Image and see the Image Tags come alive. Each tag displays text to explain a specific structure (if the Interactive Tags do not display properly due to slow Browser Speed, just refresh the page). Why are Artificial Discs implanted in the Neck? The two most common reasons for surgeons to recommend an ADR are the most common disc problems in the neck: Herniated Discs and Degenerated Discs. Herniated and Degenerated Discs in the neck often cause chronic neck and arm pain. Herniated Discs can pinch the Nerves to the arm which can lead to arm numbness and weakness. The next Image shows Disc Degeneration in the Neck. This Image is also Interactive. How does an Artificial Disc Replacement work? There are many different styles of ADRs offered by a variety of Medical Device Companies. However, the general concept is the same. 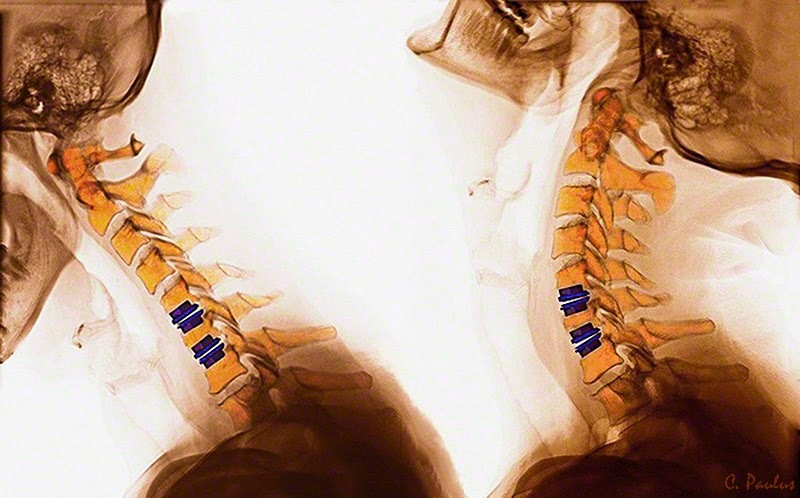 The top and bottom surfaces of an ADR are typically made of metal and are secured to the Vertebrae next to the ADR. The center core of the ADR is flexible to produce movement. ADRs try to create movement which is as similar as possible to a normal Disc. Here is a Color X-Ray which shows how an ADR moves. This Image is Interactive. What are some alternative Surgeries to an ADR? The most traditional surgery for Disc Herniations and Degenerated Discs in the neck is a Fusion Surgery, also called "Anterior Cervical Fusion and Decompression" (ACDF). ACDF surgery is designed to replace a Disc with bone. 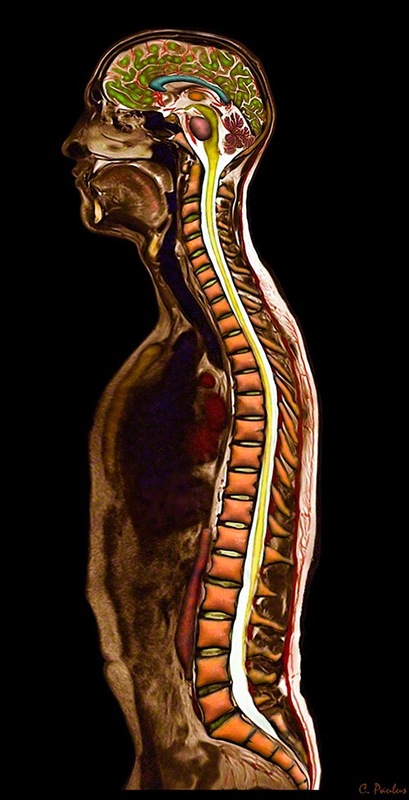 The Vertebrae above and below the diseased Disc are meant to form a solid bone bridge with this bone. Once a fusion is complete, very little if any movement is left at the fused spine segment. Here is a Color X-Ray of a Fusion Surgery in the Neck. This Image is Interactive. How is an Artificial Disc Replacement Surgery done? ADR Surgeries are performed from the front of the Spine. This is the easiest approach for a Surgeon to get to the diseased Disc. All the anatomical structures (muscles, tissue, breathing tube, swallowing tube) in the front of the neck are soft and can be moved out of the way. Once the disc comes into view, it is completely removed. The empty space is then measured to make sure the correctly sized ADR is chosen. The ADR is then carefully placed with the help of an X-Ray machine (fluoroscope). Finally, the skin is closed. How long does the recovery from Surgery take? Recovery from ADR surgery is usually quick. The ADR will be able to provide neck motion right away. However, the bones of the Vertebrae next to the ADR will take time to grow onto the ADR itself. This is needed to secure the ADR in place. If too much motion occurs too early, the ADR could theoretically move out of its ideal position. Most surgeons recommend to avoid bending the neck excessively or participate in high impact activities early after surgery. Some or all of these restrictions can be lifted within the first few months after surgery. How long does an Artificial Disc Replacement last? Any Artificial Joint Replacement like ADRs or Hip and Knee Replacements have a limited life span. The actual life span of an ADR may depend on the type of ADR, the level of patient activity, and the amount of force the ADR has to absorb over time. At this point ADR life spans are estimated in the 15-30 year range. Replacing an ADR would be a similar surgery to the original placement.